It’s a goal that lights up many a trekker’s eyes: reaching Everest Base Camp. Taking this famous – and famously challenging – trek is a mighty achievement in itself, but the appeal isn’t only in the chance to push your boundaries. It also lies in the opportunity that the trek gives you to experience the culture of Nepal’s Khumbu region – an honour that countless travellers would agree makes for an unforgettable journey. You may be dreaming of the moment when you stand on the snowy ground of Everest Base Camp, but don’t let the dream blind you to the wonderful people and places you’ll encounter on the way. Taking your time isn’t just necessary for your health as you adjust to higher altitudes; it’s good for your spirit, and spending some time in Thyangboche will show you why. 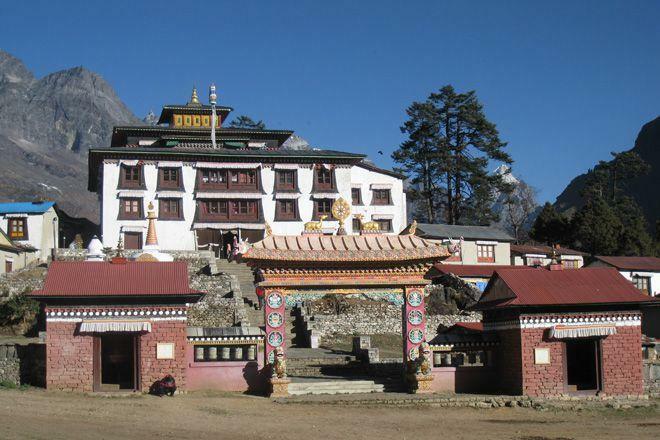 Thyangboche – also spelled Tengboche – is a village with an important Himalayan legacy. It was here, 3,867 metres above sea level, that Tenzing Norgay (who was born in the nearby village of Thani) lived and spent time as a monk. He went on to become the first member of the local Sherpa community – and, alongside Sir Edmund Hilary, one of the first two men ever – to summit Mount Everest. The restored Thyangboche monastery, an important Buddhist centre in its own right, has a special place in the hearts of locals and visitors for this reason. Many hopeful climbers pause to light candles here and ask for blessings and protection as they continue their quest. As well as the monastery, the gorgeous murals of which are a definite highlight, Thyangboche offers a Sherpa cultural centre with a museum of rare Buddhist artefacts, cafés with local delicacies and breathtaking views, genial hospitality, and, in the autumn, the spectacular Mani Rimdu festival. Those lucky enough to be heading to Everest Base Camp on one of our holidays at festival time can expect ceremonial public blessings and beautiful masked dances; but no matter when you come, the truly special atmosphere in Thyangboche will change the way you see the Himalaya.